When it comes to marketing there are many ways to reach your business goals. They don’t have to be expensive ways and you can even get started marketing online for free! Presented below are some tips to help you get started. If you don’t know who your market is you have very little chance of success due to the fact that you don’t know who to target! How can you market when you don’t know who to market to? Think of who will use your services or who will buy your product. Where are they? Go find them and start marketing! Pick up the phone…send out some emails…go door-to-door if you have to but GET THE WORD OUT! Goals are great. You want to have something to work towards, but what do you do when you reach them? Set another goal…and another…and another. It never ceases to amaze me how many businesses reach their goals and stop pushing forward. Complacency and comfort can and will kill your business. Reaching your goal is great…take some time to celebrate…but don’t spend too much time celebrating or your competition will sneak right past you. Have a budget for your marketing campaigns. Businesses can spend the bulk of their funds on marketing and these budgets can quickly spiral out of control. 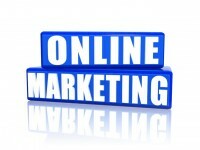 The great thing about online marketing is that you can do a lot for very little. Decide what outlets are most necessary for your product or service and don’t be afraid to spend money on marketing but be aware just how much you spend. If you aren’t getting a return on your marketing investment then it is time to redirect your efforts. Often, there are countless businesses doing what you do so what sets you apart from your competition. Quite often it is your brand. Your website, your domain and your logo introduce people to your brand. Along these lines, get a social media presence. Facebook is free…so is Twitter! Use these and other social media platforms wisely and don’t be afraid to experiment. Something may work or it may flop…but keep plugging! Content is king. Type…use keywords…type some more. It’s free and can generate traffic to your site and boost your sales! That’s the point isn’t it? Try guest blogging on more established site to reach a wider audience more quickly. Should you require assistance in meeting your online marketing goals please contact The Hardy Group at contact@hardyconsultation.com or 434-770-0230. We’ll maximize your profits and help you have your best year ever!…and remember…every day without marketing is another lost opportunity to grow your business! Spent too much on online marketing…tanks for the tips? It’s a numbers game, right?